Home Technology Smartphones Huawei Mate 20 gets a price cut! Huawei Mate 20 gets a price cut! If you’re looking for one of the best camera smartphones out there then look no further as Huawei Philippines has decided to cut the price of the Huawei Mate 20 by Php5,000! 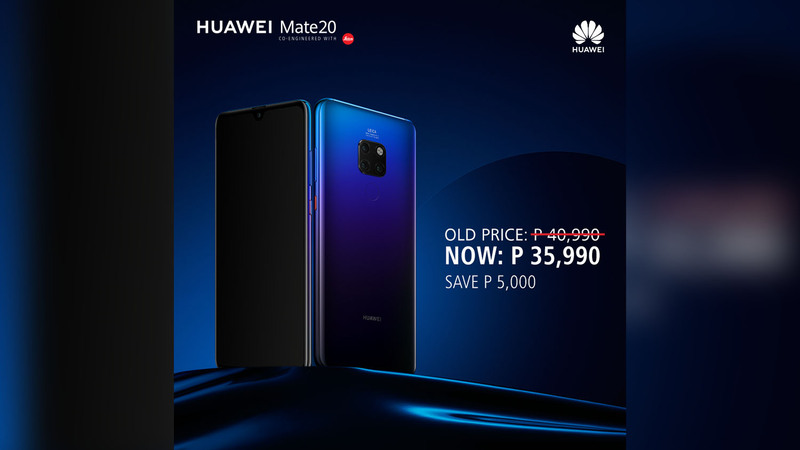 Yep, you can now purchase the Huawei Mate 20 for only Php35,990. The Huawei Mate 20 is the lesser brother of the Huawei Mate 20 Pro and it features a dewdrop display and also a Leica triple camera with AI. Unlike the Huawei Mate 20 Pro, the Huawei Mate 20 features a fingerprint scanner at the back. The Huawei Mate 20 is still powered by Kirin 980 chipset and then there’s the 6GB RAM inside along with the 128GB of storage. The Huawei Mate 20 will be available for Php35,990 this February 9.